Mix all the ingredients listed under 'for koftas' make balls. For the size I made I got around 12- 13 balls. Then roll them in corn flour, dust off excess corn flour, then heat oil and deep fry them till they are golden brown. Drain them in kitchen towel to remove excess oil if any and keep it aside. Heat oil, add bay leaf, cinnamon, cloves, mace, cardamoms, and fry for a minute or two till the aroma comes, then add the chopped onions and fry till they turn translucent. Then add chopped tomatoes and ginger garlic paste and fry till the tomatoes are cooked and turns mushy, then turn off the heat. Let it cool and then grind it into a coarse paste. Now turn on the heat, add the ground paste into the same pan, add turmeric powder, garam masala, chilli powder and mix well and let it cook for 6-7 minutes. Then add the cashew paste and water and mix well. Bring this mixture to boil and then let it simmer for 10 minutes. Then add the lukewarm milk gradually as you keep stirring and then let it simmer for 6-7 minutes. Then add crushed kasuri methi, salt and food color (if using) and let it simmer for a minute or two and turn off the heat. 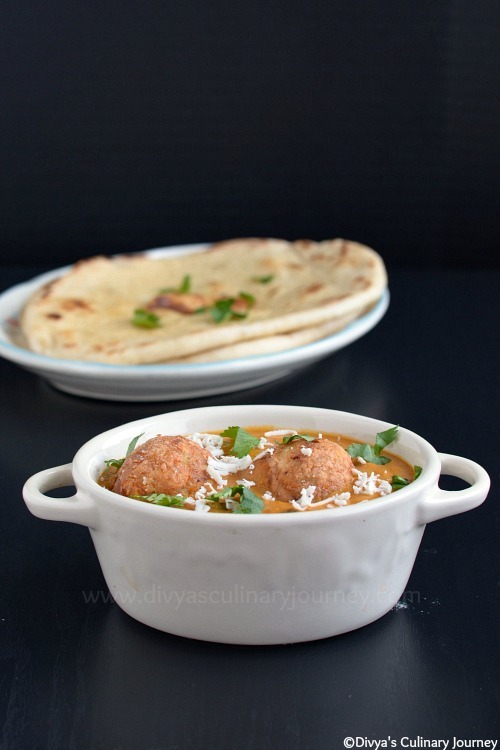 Now transfer this gravy into the serving dish, arrange the koftas in the gravy, then garnish it with grated paneer, chopped cilantro and heavy cream. 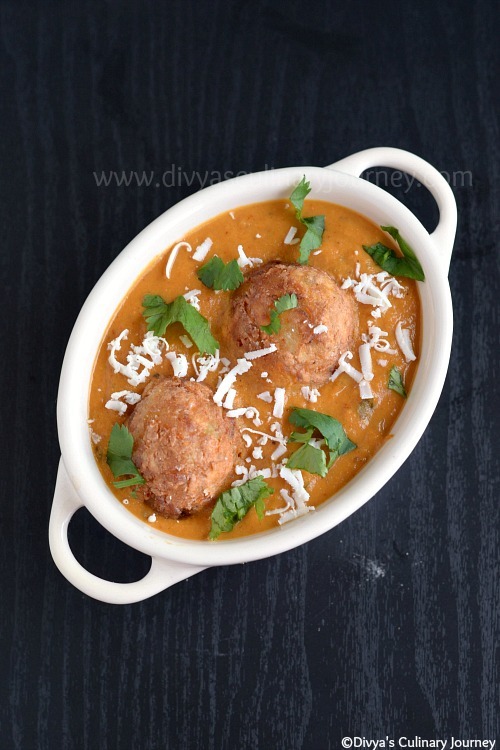 This can be served with naan, roti or any mildly spiced Pulao. Instead of adding milk for the gravy, you can add 3/4 cup of heavy cream too. The gravy will be more rich and creamy. If you like mild sweetness in the gravy, you can add little sugar while along with kasuri methi. 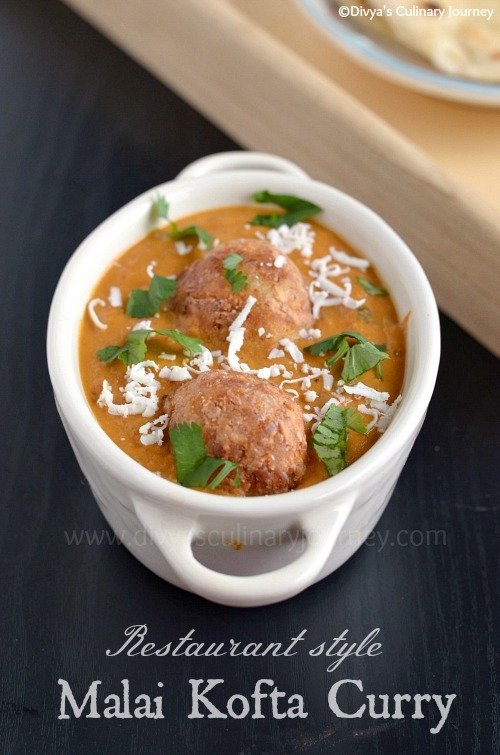 Who can resist to this droolworthy kofta, highly inviting..